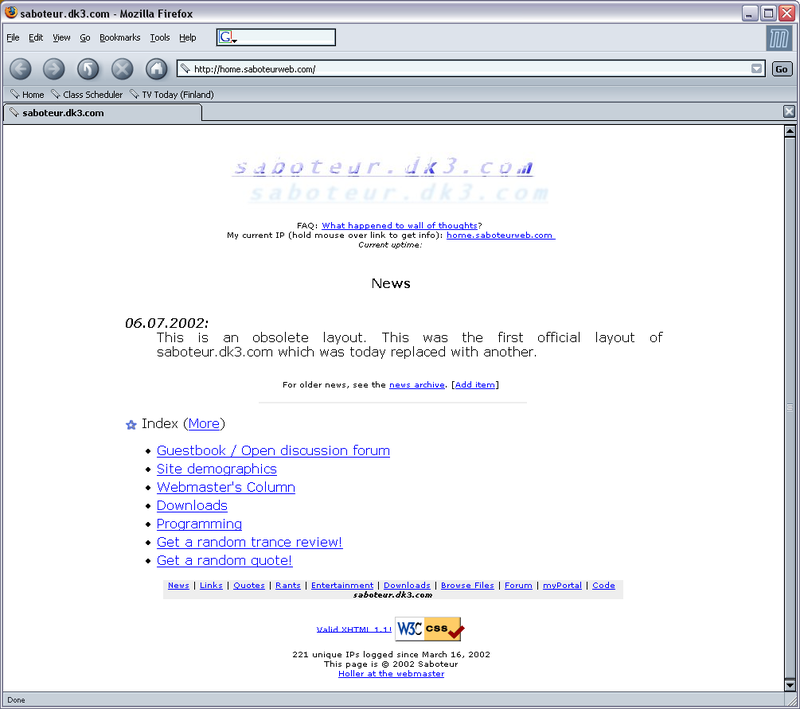 Saboteurweb.com is having an anniversary this month! It's three years since I used one intensive holiday week to set up my very own web server that later grew to become what saboteurweb.com is today. 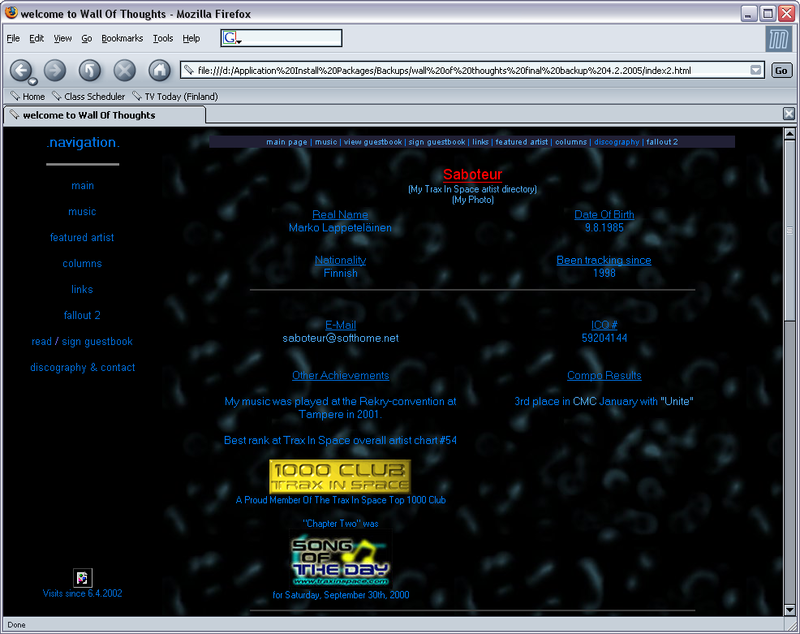 The very first versions of the site are lost forever, but I managed to capture two screenshots of how it used to look in the early days. 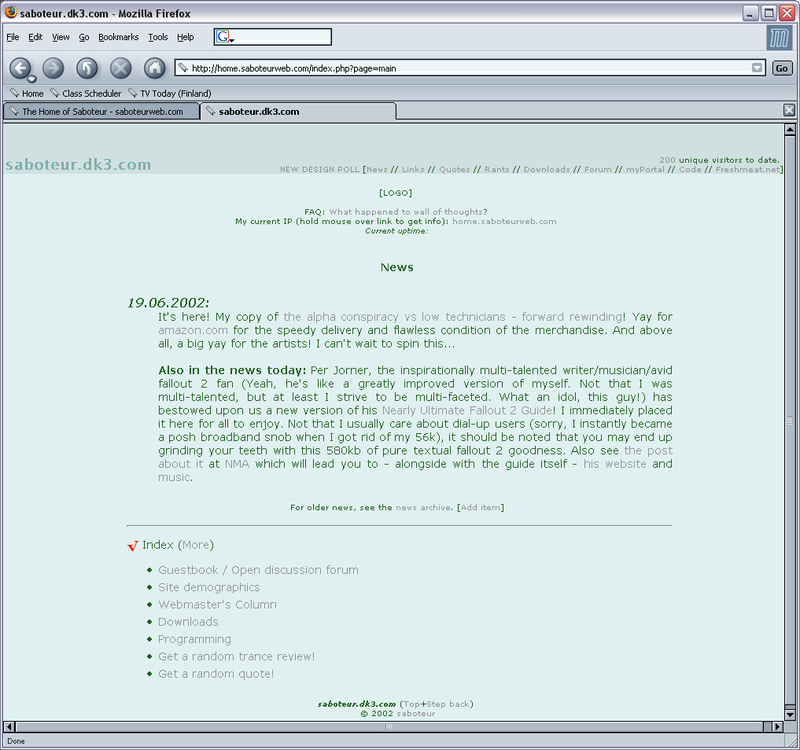 And, after some digging around almost-lost-forever files and polishing up a few scripts, I managed to put together a mostly functional version of the original "green" layout that was the basis for the green theme found on this site today. You can find it at oldskool.saboteurweb.com - some of that content is no longer available on the actual website. If you're curious, it's worth a peek. Going back even further in time, I used to have a different website, called "wall of thoughts". That one I opened in 2000 and later closed in 2002. You can view a screenshot of it here, but that site is worth its own newspost. Lots of content from that site was almost lost, but I managed to create backups of it. It's not available on the web anymore. Now, on to other news. I received "Push The Button" by The Chemical Brothers and "64 - 95" by Lemon Jelly this week, and I got the urge to review both. Chemical Brothers were better than expected, and Lemon Jelly not quite as good. Read all about it in the reviews section. As of this writing the Lemon Jelly review isn't up yet, but the Chemical Brothers review is. Music and art samples will be posted soon. Thank you for your attention, you can now return to your normal duties. If you read this entire post, I love you.